The first reference to Philistines in the Hebrew Bible is in the Table of Nations, where they are said to descend from Casluhim, son of Mizraim (Egypt). However, the Philistines of Genesis who are friendly to Abraham are identified by rabbinic sources as distinct from the warlike people described in Deuteronomistic history. Deuteronomist sources describe the "Five Lords of the Philistines"[e] as based in five city-states of the southwestern Levant: Gaza, Ashkelon, Ashdod, Ekron, and Gath, from Wadi Gaza in the south to the Yarqon River in the north. This description portrays them at one period of time as among the Kingdom of Israel's most dangerous enemies. In contrast, the Septuagint uses the term allophuloi (Greek: ἀλλόφυλοι) instead of "Philistines", which means simply "other nations". The Hebrew term Plištim occurs 286 times in the Masoretic Text of the Hebrew Bible (of which 152 times are in 1 Samuel). It also appears in the Samaritan Pentateuch. In secondary literature, the Aramaic Visions of Amram (4Q543-7) further mentions "Philistia". This is datable "prior to Antiochus IV and the Hasmonean revolt", possibly to the term of High Priest of Israel Onias II; Jubilees 46:1-47:1 might have used Amram as a source. In the Greek version of the Bible called Septuagint, the equivalent term Phylistiim occurs 12 times, again in the Pentateuch. Outside of pre-Maccabean Israelite religious literature, evidence for the name and the origins of the Philistines is less abundant and less consistent. In the remainder of the Hebrew Bible, ha-Plištim is attested at Qumran for 2 Samuel 5:17. In the Septuagint however 269 references instead use the term allophylos ("of another tribe"). The Philistines are the subject of research and speculation in biblical archaeology. Since 1846, scholars have connected the biblical Philistines with the Egyptian "Peleset" inscriptions, all five of which appear from c.1150 BCE to c.900 BCE just as archaeological references to "Kinaḫḫu" or "Ka-na-na" (Canaan) come to an end, and since 1873 comparisons were drawn between them and to the Aegean "Pelasgians". Archaeological research to date has been unable to corroborate a mass settlement of Philistines during the Ramesses III era. A "Walistina" is mentioned in Luwian texts already variantly spelled Palistina. This implies dialectical variation, a phoneme ("f"?) inadequately described in the script, or both. *Falistina was a kingdom somewhere on the 'Amuq plain, where the Amurru kingdom had held sway before it. Another theory, proposed by Jacobsohn, is that the name derives from the attested Illyrian locality Palaeste, whose inhabitants would have been called Palaestīnī according to normal grammatical practice. Allen Jones suggests that the name "Philistine" represents a corruption of the Greek phyle histia ("tribe of the hearth", with the Ionic spelling of "hestia"). The Table of Nations in Genesis 10 states in Hebrew with regard to the descendants of Mizraim, the biblical progenitor of the Egyptians: "ve-et Patrusim ve-et Kasluhim asher yats'u mi-sham Plištim ve-et Kaftorim." Literally, it says that those whom Mizraim begat included "the Pathrusim, Casluhim (out of whom came the Philistines), and the Caphtorim." There is some debate among interpreters as to whether this verse was originally intended to signify that the Philistines themselves were the offspring of the Casluhim or the Caphtorim. While the Casluhim or the Caphtorim origin is widely followed by biblical scholars, other scholars such as Friedrich Schwally, Bernhard Stade, and Cornelis Tiele argued for a Semitic origin. The Torah does not record the Philistines as one of the nations to be displaced from Canaan. In Genesis 15:18-21 the Philistines are absent from the ten nations Abraham's descendants will displace as well as being absent from the list of nations Moses tells the people they will conquer (Deut 7:1, 20:17). God also directed the Israelites away from the Philistines upon their Exodus from Egypt according to Exodus 13:17. In Genesis 21:22-27, Abraham agrees to a covenant of kindness with Abimelech, the Philistine king, and his descendants. Abraham's son Isaac deals with the Philistine king similarly, by concluding a treaty with them in chapter 26 (Genesis 26:28-29). Unlike most other ethnic groups in the Bible, the Philistines are almost always referred to without the definite article in the Torah. 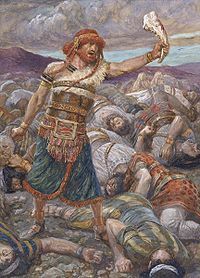 Rabbinic sources state that the Philistines of Genesis were different people from the Philistines of the Deuteronomistic history (the series of books from Joshua to 2 Kings). This differentiation was also held by the authors of the Septuagint, who translated (rather than transliterated) its base text as allophuloi (Greek: ἀλλόφυλοι, "other nations") instead of "philistines" throughout the Books of Judges and Samuel. Throughout the Deuteronomistic history, Philistines are almost always referred to without the definite article, except on 11 occasions. On the basis of the LXX's regular translation into "allophyloi", Robert Drews states that the term "Philistines" means simply "non-Israelites of the Promised Land" when used in the context of Samson, Saul and David. Judges 13:1 tells that the Philistines dominated the Israelites in the times of Samson, who fought and killed over a thousand (e.g. Judges 15). According to 1 Samuel 5-6 they even captured the Ark of the Covenant for a few months. A few biblical texts, such as the Ark Narrative and stories reflecting the importance of Gath, seem to portray Late Iron I and Early Iron II memories. They are mentioned more than 250 times, the majority in the Deuteronomistic history, and are depicted as among the arch-enemies of the Israelites, a serious and recurring threat before being subdued by David. The Bible paints the Philistines as the main enemy of the Israelites (prior to the rise of the Neo-Assyrian Empire between the 10th century BC and late 7th century BC) with a state of almost perpetual war between the two. The Philistine cities lost their independence to Assyria, and revolts in the following years were all crushed. They were subsequently absorbed into the Neo-Babylonian Empire and the Achaemenid Empire, and disappeared as a distinct ethnic group by the late 5th century BC. Amos in 1:8 sets the Philistines / ἀλλοφύλοι at Ashdod and Ekron. In 9:7 God is quoted asserting that, as he brought Israel from Egypt, he also (in the Hebrew) brought the Philistines from Caphtor. In the Greek this is, instead, bringing the ἀλλόφυλοι from Cappadocia. The Battle of Shephelah (2 Chronicles 28:18). Israelites defeated at the Battle of Aphek, Philistines capture the Ark (1 Samuel 4:1–10). Philistines defeated at the Battle of Eben-Ezer (1 Samuel 7:3–14). Some Philistine military success must have taken place subsequently, allowing the Philistines to subject the Israelites to a localised disarmament regime (1 Samuel 13:19–21 states that no Israelite blacksmiths were permitted and they had to go to the Philistines to sharpen their agricultural implements). 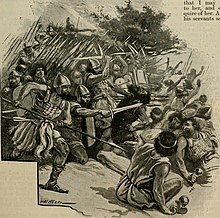 Skirmish at Michmash, Philistines routed by Jonathan and his men (1 Samuel 14). Near the Valley of Elah, David defeats Goliath in single combat (1 Samuel 17). The Philistines defeat Israelites on Mount Gilboa, killing King Saul and his three sons Jonathan, Abinadab and Malkishua (1 Samuel 31). Hezekiah defeats the Philistines as far as Gaza and its territory (2 Kings 18:5–8). According to Joshua 13:3 and 1 Samuel 6:17, the land of the Philistines (or Allophyloi), called Philistia, was a pentapolis in the southwestern Levant comprising the five city-states of Gaza, Ashkelon, Ashdod, Ekron, and Gath, from Wadi Gaza in the south to the Yarqon River in the north, but with no fixed border to the east. Tell Qasile (a "port city") and Aphek were located on the northern frontier of Philistine territory, and Tell Qasile in particular may have been inhabited by both Philistine and non-Philistine people. The location of Gath is not entirely certain, although the site of Tell es-Safi, not far from Ekron, is currently the most favoured. The identity of the city of Ziklag, which according to the Bible marked the border between the Philistine and Israelite territory, remains uncertain. Since Edward Hincks and William Osburn Jr. in 1846, biblical scholars have connected the biblical Philistines with the Egyptian "Peleset" inscriptions; and since 1873, both have been connected with the Aegean "Pelasgians". The evidence for these connections is etymological and has been disputed. Inscriptions written by the Philistines have not yet been found or conclusively identified. Based on the Peleset inscriptions, it has been suggested that the Casluhite Philistines formed part of the conjectured "Sea Peoples" who repeatedly attacked Egypt during the later Nineteenth Dynasty. Though they were eventually repulsed by Ramesses III, he finally resettled them, according to the theory, to rebuild the coastal towns in Canaan. Papyrus Harris I details the achievements of the reign of Ramesses III. In the brief description of the outcome of the battles in Year 8 is the description of the fate of some of the conjectured Sea Peoples. Ramesses claims that, having brought the prisoners to Egypt, he "settled them in strongholds, bound in my name. Numerous were their classes, hundreds of thousands strong. I taxed them all, in clothing and grain from the storehouses and granaries each year." Some scholars suggest it is likely that these "strongholds" were fortified towns in southern Canaan, which would eventually become the five cities (the Pentapolis) of the Philistines. Israel Finkelstein has suggested that there may be a period of 25–50 years after the sacking of these cities and their reoccupation by the Philistines. It is quite possible that for the initial period of time, the Philistines were housed in Egypt; only subsequently late in the troubled end of the reign of Ramesses III would they have been allowed to settle Philistia. The "Peleset" appear in four different texts from the time of the New Kingdom. Two of these, the inscriptions at Medinet Habu and the Rhetorical Stela at Deir al-Medinah, are dated to the time of the reign of Ramesses III (1186–1155 BC). Another was composed in the period immediately following the death of Ramesses III (Papyrus Harris I). The fourth, the Onomasticon of Amenope, is dated to some time between the end of the 12th or early 11th century BC. The inscriptions at Medinet Habu consist of images depicting a coalition of Sea Peoples, among them the Peleset, who are said in the accompanying text to have been defeated by Ramesses III during his Year 8 campaign. In about 1175 BC, Egypt was threatened with a massive land and sea invasion by the "Sea Peoples," a coalition of foreign enemies which included the Tjeker, the Shekelesh, the Deyen, the Weshesh, the Teresh, the Sherden, and the PRST. They were comprehensively defeated by Ramesses III, who fought them in "Djahy" (the eastern Mediterranean coast) and at "the mouths of the rivers" (the Nile Delta), recording his victories in a series of inscriptions in his mortuary temple at Medinet Habu. Scholars have been unable to conclusively determine which images match what peoples described in the reliefs depicting two major battle scenes. A separate relief on one of the bases of the Osirid pillars with an accompanying hieroglyphic text clearly identifying the person depicted as a captive Peleset chief is of a bearded man without headdress. This has led to the interpretation that Ramesses III defeated the Sea Peoples including Philistines and settled their captives in fortresses in southern Canaan; another related theory suggests that Philistines invaded and settled the coastal plain for themselves. The soldiers were quite tall and clean shaven. They wore breastplates and short kilts, and their superior weapons included chariots drawn by two horses. They carried small shields and fought with straight swords and spears. The Rhetorical Stela are less discussed, but are noteworthy in that they mention the Peleset together with a people called the Teresh, who sailed "in the midst of the sea". The Teresh are thought to have originated from the Anatolian coast and their association with the Peleset in this inscription is seen as providing some information on the possible origin and identity of the Philistines. The Harris Papyrus which was found in a tomb at Medinet Habu also recalls Ramesses III's battles with the Sea Peoples, declaring that the Peleset were "reduced to ashes." The Papyrus Harris I, records how the defeated foe were brought in captivity to Egypt and settled in fortresses. The Harris papyrus can be interpreted in two ways: either the captives were settled in Egypt and the rest of the Philistines/Sea Peoples carved out a territory for themselves in Canaan, or else it was Ramesses himself who settled the Sea Peoples (mainly Philistines) in Canaan as mercenaries. Egyptian strongholds in Canaan are also mentioned, including a temple dedicated to Amun, which some scholars place in Gaza; however, the lack of detail indicating the precise location of these strongholds means that it is unknown what impact these had, if any, on Philistine settlement along the coast. The only mention in an Egyptian source of the Peleset in conjunction with any of the five cities that are said in the Bible to have made up the Philistine pentapolis comes in the Onomasticon of Amenope. The sequence in question has been translated as: "Ashkelon, Ashdod, Gaza, Assyria, Shubaru [...] Sherden, Tjekker, Peleset, Khurma [...]" Scholars have advanced the possibility that the other Sea Peoples mentioned were connected to these cities in some way as well. In 2003, a statue of a king named Taita bearing inscriptions in Luwian was discovered during excavations conducted by German archeologist Kay Kohlmeyer in the Citadel of Aleppo. The new readings of Anatolian hieroglyphs proposed by the Hittitologists Elisabeth Rieken and Ilya Yakubovich were conducive to the conclusion that the country ruled by Taita was called Palistin. This country extended in the 11th-10th centuries BCE from the Amouq Valley in the west to Aleppo in the east down to Mehardeh and Shaizar in the south. Due to the similarity between Palistin and Philistines, Hittitologist John David Hawkins (who translated the Aleppo inscriptions) hypothesizes a connection between the Syro-Hittite Palistin and the Philistines, as do archaeologists Benjamin Sass and Kay Kohlmeyer. Gershon Galil suggests that King David halted the Arameans’ expansion into the Land of Israel on account of his alliance with the southern Philistine kings, as well as with Toi, king of Ḥamath, who is identified with Tai(ta) II, king of Palistin (the northern Sea Peoples). However, the relation between Palistin and the Philistines is much debated. Israeli professor Itamar Singer notes that there is nothing (besides the name) in the recently discovered archeology that indicates an Aegean origin to Palistin; most of the discoveries at the Palistin capital Tell Tayinat indicate a Neo-Hittite state, including the names of the kings of Palistin. Singer proposes (based on archeological finds) that a branch of the Philistines settled in Tell Tayinat and were replaced or assimilated by a new Luwian population who took the Palistin name. Many scholars have interpreted the ceramic and technological evidence attested to by archaeology as being associated with the Philistine advent in the area as strongly suggestive that they formed part of a large scale immigration to southern Canaan, probably from Anatolia and Cyprus, in the 12th century BCE. However, scholars such as London, Brug, Bunimovitz, H. Weippert, and Noort, among others, have noted the "difficulty of associating pots with people", proposing alternative suggestions such as potters following their markets or technology transfer, and emphasize the continuities with the local world in the material remains of the coastal area identified with "Philistines", rather than the differences emerging from the presence of Cypriote and/or Aegean/ Mycenaean influences. The view is summed up in the idea that 'Kings come and go, but the pots remain', suggesting that the foreign Aegean elements in the Philistine population may have been a minority. The proposed connection between Mycenaean culture and Philistine culture was further documented by finds at the excavation of Ashdod, Ekron, Ashkelon, and more recently Gath, four of the five Philistine cities in Canaan. The fifth city is Gaza. Especially notable is the early Philistine pottery, a locally made version of the Aegean Mycenaean Late Helladic IIIC pottery, which is decorated in shades of brown and black. This later developed into the distinctive Philistine pottery of the Iron Age I, with black and red decorations on white slip known as Philistine Bichrome ware. Also of particular interest is a large, well-constructed building covering 240 square metres (2,600 sq ft), discovered at Ekron. Its walls are broad, designed to support a second story, and its wide, elaborate entrance leads to a large hall, partly covered with a roof supported on a row of columns. In the floor of the hall is a circular hearth paved with pebbles, as is typical in Mycenaean megaron hall buildings; other unusual architectural features are paved benches and podiums. Among the finds are three small bronze wheels with eight spokes. Such wheels are known to have been used for portable cultic stands in the Aegean region during this period, and it is therefore assumed that this building served cultic functions. Further evidence concerns an inscription in Ekron to PYGN or PYTN, which some have suggested refers to "Potnia", the title given to an ancient Mycenaean goddess. Excavations in Ashkelon, Ekron, and Gath reveal dog and pig bones which show signs of having been butchered, implying that these animals were part of the residents' diet. Among other findings there are wineries where fermented wine was produced, as well as loom weights resembling those of Mycenaean sites in Greece. Material culture evidence, primarily pottery styles, indicates that the Philistines originally settled in a few sites in the south, such as Ashkelon, Ashdod and Ekron. It was not until several decades later, about 1150 BC, that they expanded into surrounding areas such as the Yarkon region to the north (the area of modern Jaffa, where there were Philistine farmsteads at Tel Gerisa and Aphek, and a larger settlement at Tel Qasile). Most scholars, therefore, believe that the settlement of the Philistines took place in two stages. In the first, dated to the reign of Ramesses III, they were limited to the coastal plain, the region of the Five Cities; in the second, dated to the collapse of Egyptian hegemony in southern Canaan, their influence spread inland beyond the coast. During the 10th to 7th centuries BC, the distinctiveness of the material culture appears to have been absorbed with that of surrounding peoples. The Leon Levy Expedition, consisting of archaeologists from Harvard University, Boston College, Wheaton College in Illinois and Troy University in Alabama, conducted a 30-year investigation of the burial practices of the Philistines, by excavating a Philistine cemetery containing more than 150 burials dating from the 11th to 8th century BCE Tel Ashkelon. The expedition withheld announcing the results of the excavations for three years, until their work was completed, concerned about the reaction of ultra-Orthodox Jewish protesters, who are known to protest against excavations, arguing that such digging violates Jewish religious law, by potentially disturbing Jewish remains in the excavation area. In July 2016, the expedition finally announced the results of their excavation. Archaeological evidence, provided by architecture, burial arrangements, ceramics, and pottery fragments inscribed with non-Semitic writing, indicates that the Philistines were not native to Canaan. Most of the 150 dead were buried in oval-shaped graves, some were interred in ashlar chamber tombs, while there were 4 who were cremated. These burial arrangements were very common to the Aegean cultures, but not to the one indigenous to Canaan. Lawrence Stager of Harvard University believes that Philistines came to Canaan by ships before the Battle of the Delta circa 1175 BCE. DNA was extracted from the skeletons for archaeogenetic population analysis. The population of the area associated with Philistines is estimated to have been around 25,000 in the 12th century BC, rising to a peak of 30,000 in the 11th century BC. The Canaanite nature of the material culture and toponyms suggest that much of this population was indigenous, such that the migrant element would likely constitute less than half the total, and perhaps much less. Nothing is known for certain about the language of the Philistines. Pottery fragments from the period of around 1500–1000 BCE have been found bearing inscriptions in non-Semitic languages, including one in a Cypro-Minoan script. The Bible does not mention any language problems between the Israelites and the Philistines, as it does with other groups up to the Babylonian occupation. Later, Nehemiah 13:23-24 writing under the Achaemenids records that when Judean men intermarried women from Moab, Ammon and Philistine cities, half the offspring of Judean marriages with women from Ashdod could speak only their mother tongue, Ašdôdît, not Judean Hebrew (Yehûdît); although by then this language might have been an Aramaic dialect. There is some limited evidence in favour of the assumption that the Philistines were originally Indo-European-speakers, either from Greece or Luwian speakers from the coast of Asia Minor, on the basis of some Philistine-related words found in the Bible not appearing to be related to other Semitic languages. Such theories suggest that the Semitic elements in the language were borrowed from their neighbours in the region. For example, the Philistine word for captain, "seren", may be related to the Greek word tyrannos (thought by linguists to have been borrowed by the Greeks from an Anatolian language, such as Luwian or Lydian). Although most Philistine names are Semitic (such as Ahimelech, Mitinti, Hanun, and Dagon) some of the Philistine names, such as Goliath, Achish, and Phicol, appear to be of non-Semitic origin, and Indo-European etymologies have been suggested. Recent finds of inscriptions written in Hieroglyphic Luwian in Palistin substantiate a connection between the language of the kingdom of Palistin and the Philistines of the southwestern Levant. The deities worshipped in the area were Baal, Astarte, and Dagon, whose names or variations thereof had already appeared in the earlier attested Canaanite pantheon. Cities excavated in the area attributed to Philistines give evidence of careful town planning, including industrial zones. The olive industry of Ekron alone includes about 200 olive oil installations. Engineers estimate that the city's production may have been more than 1,000 tons, 30 percent of Israel's present-day production. There is considerable evidence for a large industry in fermented drink. Finds include breweries, wineries, and retail shops marketing beer and wine. Beer mugs and wine kraters are among the most common pottery finds. ^ "Lords" is a translation of sarnei (סַרְנֵ֣י) in Hebrew. The equivalent in the Greek of the Septuagint is satraps (σατραπείαις). ^ Raffaele D'Amato; Andrea Salimbeti (2015). Sea Peoples of the Bronze Age Mediterranean c.1400 BC-1000 BC. Bloomsbury Publishing. pp. 30–32. ISBN 978-1-4728-0683-3. ^ Hans Wildberger (1979) . Isaiah 13-27: A Continental Commentary. Translated by Thomas H. Trapp. Fortress Press. p. 95. ISBN 978-1-4514-0934-5. ^ "Genesis 10 / Hebrew - English Bible / Mechon-Mamre". mechon-mamre.org. ^ a b c d Fahlbusch & Bromiley 2005, "Philistines", p. 185. ^ a b Romey, Kristin (2016). "Discovery of Philistine Cemetery May Solve Biblical Mystery." National Geographic (website). Retrieved 31 July 2017. ^ W. Max Müller (1906). "Cherethites". In Isidore Singer (ed.). Jewish Encyclopedia. Ktav Publishing House. ^ Vandersleyen 1985, p. 53: "To conclude. the Philistines came neither from Crete nor from the Aegean islands or coasts, but probably from the southern coast of Asia Minor or from Syria." ^ Biblical archaeology: "Ashkelon's cemetery supports the Philistines' distinctness from their neighbors and may be able to connect the Philistines to related populations in the Aegean world." ^ Britannica.com:"Already, the find in Ashkelon seems to point toward an Aegean origin, since the oval-shaped graves resemble those found in the Aegean cultural sphere. Genetic testing of the human remains will provide further information." ^ a b Philippe Bohstrom, 'Archaeologists find first-ever Philistine cemetery in Israel,' Haaretz 10 July 2016. : "Cemetery in ancient Ashkelon, dating back 2700-3000 years, proves the Philistines came from the Aegean, and that in contrast to the conventional wisdom, they were a peaceful folk. ^ "Origin and meaning of the name Palestine by". Online Etymology Dictionary. Retrieved 6 October 2018. ^ Genesis 10:13, 21:32-34 and 26:1f; etc. ^ Robert R. Duke (2010). The Social Location of the Visions of Amram (4Q543-547). Peter Lang. pp. 17, 89, 99. ^ 4QSama column 35 (2 Sam 4:9-6:3) edited Andrew Fincke (2001). The Samuel Scroll from Qumran: 4QSama Restored and Compared to the Septuagint and 4QSamc. Brill. p. 144. ^ a b Hincks, Edward (1846). "An Attempt to Ascertain the Number, Names, and Powers, of the Letters of the Hieroglyphic, or Ancient Egyptian Alphabet; Grounded on the Establishment of a New Principle in the Use of Phonetic Characters". The Transactions of the Royal Irish Academy (21): 176. JSTOR 30079013. ^ a b Osburn, William (1846). Ancient Egypt, Her Testimony to the Truth of the Bible. Samuel Bagster and sons. p. 107. ^ a b Vandersleyen 1985, pp. 40–41 n.9: [Original French]: "À ma connaissance, les plus anciens savants qui ont proposé explicitement l' identification des Pourousta avec les Philistins sont William Osburn Jr., Ancient Egypt, Her Testimony to the Truth of the Bible..., Londres 1846. p. 99. 107. 137. et Edward Hincks, An Attempt to Ascertain the Number, Names, and Powers, of the Letters of the Hieroglyphic or Ancient Egyptian Alphabet, Dublin, 1847, p.47"
[Translation]: "To my knowledge, the earliest scholars who explicitly proposed the identification of Pourousta with the Philistines are William Osburn Jr., Ancient Egypt, Her Testimony to the Truth of the Bible ..., London, 1846. pp. 99, 107, 137, and Edward Hincks, An Attempt to Ascertain the Number, Names, and Powers, of the Letters of the Alphabet Egyptian Hieroglyphic gold Ancient , Dublin, 1847, p.47"
^ a b Vandersleyen 1985, pp. 39–41: [original French]: "Quand Champollion visita Médinet Habou en juin 1829, il vit ces scénes, lut le nom des Pourosato, sans y reconnaître les Philistins; plus tard, dans son Dictionnaire égyptien et dans sa Grammaire égyptienne, il transcrivit le même nom Polosté ou Pholosté, mais contrairement à ce qu'affirmait Brugsch en 1858 et tous les auteurs postérieurs, Champollion n'a nulle part écrit que ces Pholosté étaient les Philistins de la Bible." ^ Drews 1998, p. 49: "As the Egyptian province in Asia collapsed after the death of Merneptah, and as the area that identified itself as 'Canaan' shrank to the coastal cities beneath the Lebanon range, the names 'Philistia' and 'Philistines' (or, more plainly, 'Palestine' and 'Palestinians') came to the fore"
^ Drews 1995, p. 55:"A slight shift occurred in 1872, when F. Chabas published the first translation of all the texts relating to the wars of Merneptah and Ramesses III. Chabas found it strange that the Peleset shown in the reliefs were armed and garbed in the same manner as "European" peoples such as the Sicilians and Sardinians, and he therefore argued that these Peleset were not from Philistia after all, but were Aegean Pelasgians. It was this unfortunate suggestion that triggered Maspero's wholesale revision of the entire episode. In his 1873 review of Chabas's book, Maspero agreed that the Peleset of Medinet Habu were accoutred more like Europeans than Semites and also agreed that they were Aegean Pelasgians. But he proposed that it must have been at this very time — in the reign of Ramesses III — that these Pelasgians became Philistines." ^ a b Assaf Yasur-Landau (16 June 2014). The Philistines and Aegean Migration at the End of the Late Bronze Age. Cambridge University Press. p. 180. ISBN 978-1-139-48587-6. It seems, then, that the etymological evidence for the origin of the Philistines and other Sea Peoples can be defined as unfocused and ambiguous at best. ^ Israel Finkelstein, Is The Philistine Paradigm Still Viable?, in: Bietak, M., (Ed. ), The Synchronisation of Civilisations in the Eastern Mediterranean in the Second Millennium B. C. III. Proceedings of the SCIEM 2000 – 2nd Euro- Conference, Vienna, 28th of May–1st of June 2003, Denkschriften der Ge- samtakademie 37, Contributions to the Chronology of the Eastern Mediterranean 9, Vienna 2007, pages 517–524. Quote: "SUMMARY Was there a Sea Peoples migration to the coast of the Levant? Yes. Was it a maritime migration? Possibly. Was there a massive maritime Sea Peoples invasion? Probably not. Did the Philistines settle en-mass in Philistia in the days of Ramesses III? No. Were the Iron I Philistine cities fortified? No. Were the Iron I Philistines organized in a peer-polity system? Probably not. Was there a Philistine Pentapolis system in the Iron I? No. Are the Iron I Philistines the Philistines described in the Bible? No." ^ Drews 1995, p. 69: "For the modern myth that has replaced it, however, there is [no basis]. Instead of questioning the story of the Philistines Cretan origins, in an attempt to locate a core of historical probability, Maspero took the story at face value and proceeded to inflate it to fantastic dimensions. 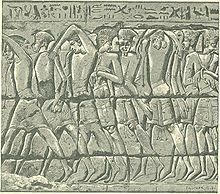 Believing that the Medinet Habu reliefs, with their ox carts, depict the Philistine nation on the eve of its settlement in Canaan, Maspero imagined a great overland migration. The Philistines moved first from Crete to Caria, he proposed, and then from Caria to Canaan in the time of Ramesses III. Whereas Amos and Jeremiah derived the Philistines directly from Crete, a five-day sail away, Maspero's myth credited them with an itinerary that, while reflecting badly on their intelligence, testified to prodigious physical stamina: the Philistines sail from Crete to Caria, where they abandon their ships and their maritime tradition; the nation then travels in ox carts through seven hundred miles of rough and hostile terrain until it reaches southern Canaan; at that point, far from being debilitated by their trek, the Philistines not only conquer the land and give it their name but come within a hair's breadth of defeating the Egyptian pharaoh himself. Not surprisingly, for the migration from Caria to Canaan imagined by Maspero there is no evidence at all, whether literary, archaeological, or documentary. Since none of Maspero's national migrations is demonstrable in the Egyptian inscriptions, or in the archaeological or linguistic record, the argument that these migrations did indeed occur has traditionally relied on place-names. These place-names are presented as the source from which were derived the ethnica in Merneptahs and Ramesses inscriptions." ^ Ussishkin 2008, p. 207: "Reconstruction of the Philistine migration and settlement on the basis of the above model is hard to accept. First, it is not supported by any factual evidence. Second, it assumes that the Philistines had at their disposal a large and strong naval force of a kind unknown in this period. Third, in the period immediately following their settlement in Philistia there is hardly any archaeological evidence connecting the Philistine culture and settlement with sea and navigation. Had the Philistines really possessed such a strong naval force and tradition, as suggested by Stager, we would expect to observe these associations in their material culture in later times." ^ J. David Hawkins (2011). "The inscriptions of the Aleppo Temple". Anatolian Studies. 61: 35–54. doi:10.1017/s0066154600008772. ^ Inscription TELL TAYINAT 1: J. David Hawkins (2000). Corpus of Hieroglyphic Luwian Inscriptions 1. Inscriptions of the Iron Age. Berlin: de Gruyter. p. 2.366. ^ Bonfante 1946, pp. 251–262. ^ Jones 1972, pp. 343–350. ^ Macalister 1911, p. 14. ^ a b Macalister 1911: "There is a peculiarity in the designation of the Philistines in Hebrew which has often been noticed, and which must have a certain significance. In referring to a tribe or nation, the Hebrew writers as a rule either (a) personified an imaginary founder, making his name stand for the tribe supposed to derive from him—e. g. 'Israel' for the Israelites; or (b) used the tribal name in the singular, with the definite article—a usage sometimes transferred to the Authorized Version, as in such familiar phrases as 'the Canaanite was then in the land' (Gen. xii. 6); but more commonly assimilated to the English idiom which requires a plural, as in 'the iniquity of the Amorite[s] is not yet full' (Gen. xv. 16). But in referring to the Philistines, the plural of the ethnic name is always used, and as a rule, the definite article is omitted. A good example is afforded by the name of the Philistine territory above mentioned, 'ereṣ Pelištīm, literally 'the land of Philistines': contrast such an expression as 'ereṣ hak-Kena'anī, literally 'the land of the Canaanite'. A few other names, such as that of the Rephaim, are similarly constructed: and so far as the scanty monuments of Classical Hebrew permit us to judge, it may be said generally that the same usage seems to be followed when there is question of a people not conforming to the model of Semitic (or perhaps we should rather say Aramaean) tribal organization. The Canaanites, Amorites, Jebusites, and the rest, are so closely bound together by the theory of blood-kinship which even yet prevails in the Arabian deserts, that each may logically be spoken of as an individual human unit. No such polity was recognized among the pre-Semitic Rephaim, or the intruding Philistines so that they had to be referred to as an aggregate of human units. This rule, it must be admitted, does not seem to be rigidly maintained; for instance, the name of the pre-Semitic Horites might have been expected to follow the exceptional construction. But a hard-and-fast adhesion to so subtle a distinction, by all the writers who have contributed to the canon of the Hebrew scriptures and by all the scribes who have transmitted their works, is not to be expected. Even in the case of the Philistines, the rule that the definite article should be omitted is broken in eleven places. [Namely Joshua xiii. 2; 1 Sam. iv. 7, vii. 12, xiii. 20, xvii. 51, 52; 2 Sam. v. 19, xxi. 12, 17; 1 Chron. xi. 13; 2 Chron. xxi. 16]"
^ Drews 1998, p. 49: "Our names 'Philistia' and 'Philistines' are unfortunate obfuscations, first introduced by the translators of the LXX and made definitive by Jerome's Vg. When turning a Hebrew text into Greek, the translators of the LXX might simply—as Josephus was later to do—have Hellenized the Hebrew פְּלִשְׁתִּים as Παλαιστίνοι, and the toponym פְּלִשְׁתִּ as Παλαιστίνη. Instead, they avoided the toponym altogether, turning it into an ethnonym. As for the ethnonym, they chose sometimes to transliterate it (incorrectly aspirating the initial letter, perhaps to compensate for their inability to aspirate the sigma) as φυλιστιιμ, a word that looked exotic rather than familiar, and more often to translate it as ἀλλόφυλοι. Jerome followed the LXX's lead in eradicating the names, 'Palestine' and 'Palestinians', from his Old Testament, a practice adopted in most modern translations of the Bible." ^ Drews 1998, p. 51: "The LXX's regular translation of פְּלִשְׁתִּים into ἀλλόφυλοι is significant here. Not a proper name at all, allophyloi is a generic term, meaning something like 'people of other stock'. If we assume, as I think we must, that with their word allophyloi the translators of the LXX tried to convey in Greek what p'lištîm had conveyed in Hebrew, we must conclude that for the worshippers of Yahweh p'lištîm and b'nê yiśrā'ēl were mutually exclusive terms, p'lištîm (or allophyloi) being tantamount to 'non-Judaeans of the Promised Land' when used in a context of the third century BCE, and to 'non-Israelites of the Promised Land' when used in a context of Samson, Saul and David. Unlike an ethnonym, the noun פְּלִשְׁתִּים normally appeared without a definite article." ^ Finkelstein 2002, pp. 131–167. ^ Meyers 1997, p. 313. ^ "Read the Bible text :: academic-bible.com". www.academic-bible.com. ^ Herzog & Gichon 2006. ^ Gösta Werner Ahlström (1993). The History of Ancient Palestine. Fortress Press. p. 311. ISBN 978-0-8006-2770-6. ^ Trevor Bryce (10 September 2009). The Routledge Handbook of the Peoples and Places of Ancient Western Asia: The Near East from the Early Bronze Age to the fall of the Persian Empire. Routledge. p. 249. ISBN 978-1-134-15907-9. ^ The End of the Bronze Age: Changes in Warfare and the Catastrophe Ca. 1200 B.C., Robert Drews, p55 Quote: "A slight shift occurred in 1872, when F. Chabas published the first translation of all the texts relating to the wars of Merneptah and Ramesses III. Chabas found it strange that the Peleset shown in the reliefs were armed and garbed in the same manner as "European" peoples such as the Sicilians and Sardinians, and he, therefore, argued that these Peleset were not from Philistia after all but were Aegean Pelasgians. It was this unfortunate suggestion that triggered Maspero's wholesale revision of the entire episode. In his 1873 review of Chabas's book, Maspero agreed that the Peleset of Medinet Habu were accoutred more like Europeans than Semites and also agreed that they were Aegean Pelasgians. But he proposed that it must have been at this very time — in the reign of Ramesses III — that these Pelasgians became Philistines." ^ a b c d e f Killebrew 2005, p. 202. ^ The End of the Bronze Age: Changes in Warfare and the Catastrophe Ca. 1200 B.C., Robert Drews, p48–61 Quote: "The thesis that a great "migration of the Sea Peoples" occurred ca. 1200 B.C. is supposedly based on Egyptian inscriptions, one from the reign of Merneptah and another from the reign of Ramesses III. Yet in the inscriptions themselves, such a migration nowhere appears. After reviewing what the Egyptian texts have to say about 'the sea peoples', one Egyptologist (Wolfgang Helck) recently remarked that although some things are unclear, "eins ist aber sicher: Nach den agyptischen Texten haben wir es nicht mit einer 'Volkerwanderung' zu tun." Thus the migration hypothesis is based not on the inscriptions themselves but on their interpretation." ^ Redford 1992, p. 289. ^ Ehrlich 1996, p. 9. ^ a b "Philistines | Follow The Rabbi". followtherabbi.com. Retrieved 25 September 2014. ^ a b c Killebrew 2005, pp. 204–205. ^ Ehrlich 1996, pp. 7–8. ^ Ehrlich 1996, p. 8 (Footnote #42). ^ "The History of King David in Light of New Epigraphic and Archeological Data - אוניברסיטת חיפה". www.haifa.ac.il. ^ Ann E. Killebrew, Biblical Peoples and Ethnicity: An Archaeological Study of Egyptians, Canaanites, Philistines, and Early Israel, 1300–1100 B.C.E, Society of Biblical Lit, 2005 p.230. ^ Carl S. Ehrlich (1996). The Philistines in Transition: A History from Ca. 1000-730 B.C.E. BRILL. p. 10. ISBN 90-04-10426-7. : Quote: "The difficulty of associating pots with peoples or ethnic groups has often been commented on. Nonetheless, the association of the Philistines with the Iron Age I bichrome pottery bearing their name is most often taken for granted. Although scholars have backed off from postulating that every site with bichrome pottery was under Philistine control, the ethnic association remains... A cautionary note has, however, been sounded in particular by Brug, Bunimovitz, H. Weippert, and Noort, among others. In essence, their theories rest on the fact that even among sites in the Philistine heartland, the supposed Philistine pottery does not represent the major portion of the finds... While not denying Cypriote and/or Aegean/ Mycenean influence in the material cultural traditions of coastal Canaan in the early Iron Age, in addition to that of Egyptian and local Canaanite traditions, the above named "minimalist" scholars emphasize the continuities between the ages and not the differences. As H. Weippert has stated, "Konige kommen, Konige gehen, aber die Kochtopfe bleiben." In regard to the bichrome pottery, she follows Galling and speculates that it was produced by a family or families of Cypriote potters who followed their markets and immigrated into Canaan once the preexisting trade connections had been severed. The find at Tell Qasile of both bichrome and Canaanite types originating in the same pottery workshop would appear to indicate that the ethnic identification of the potters is at best an open question. At any rate, it cannot be facilely assumed that all bichrome ware was produced by "ethnic" Philistines. Thus Bunimovitz's suggestion to refer to "Philistia pottery" rather than to "Philistine" must be given serious consideration... What holds true for the pottery of Philistia also holds true for other aspects of the regional material culture. Whereas Aegean cultural influence cannot be denied, the continuity with the Late Bronze traditions in Philistia has increasingly come to attention. A number of Iron Age I features which were thought to be imported by the Philistines have been shown to have Late Bronze Age antecedents. It would hence appear that the Philistines of foreign (or "Philistine") origin were the minority in Philistia." ^ Gloria London (2003). "Ethnicity and Material Culture". In Suzanne Richard (ed.). Near Eastern Archaeology: A Reader. Eisenbrauns. p. 146. ISBN 978-1-57506-083-5. ^ Maeir 2005, pp. 528–536. ^ Levy 1998, Chapter 20: Lawrence E. Stager, "The Impact of the Sea Peoples in Canaan (1185–1050 BC)", p. 344. ^ Stager, Lawrence. "When Canaanites and Philistines Ruled Ashkelon". Biblical Archaeological Review. Archived from the original on 19 May 2011. Retrieved 4 April 2011. ^ Schloen, David (30 July 2007). "Recent Discoveries at Ashkelon". The Oriental Institute of the University of Chicago. Retrieved 4 April 2011. ^ a b Fantalkin & Yasur-Landau 2008, Yuval Gadot, "Continuity and Change in the Late Bronze to Iron Age Transition in Israel's Coastal Plain: A Long-Term Perspective", pp. 63–64: "Based on material culture studies, we know that the Philistines initially immigrated only to the southern Coastal Plain". ^ Grabbe 2008, p. 213. ^ Killebrew 2005, p. 234: "During the Iron II (tenth-seventh centuries B.C.E. ), the Philistines completed the process of acculturation with the surrounding indigenous culture (Stone 1995). By the end of the Iron II, the Philistines had lost much of their distinctiveness as expressed in their material culture (see Gitin 1998; 2003; 2004 and bibliography there). My suggested chronological framework for Philistine acculturation spans the tenth to seventh centuries B.C.E. (Tel Miqne-Ekron Strata IV-I; Ashdod Strata X-VI).". ^ "Ancient philistine cemetery in Israel could solve one of the Bible's biggest mysteries". www.msn.com. ^ "Long Buried By Bad Reputation, Philistines Get New Life With Archaeological Find". NPR.org. ^ a b Yasur-Landau 2010, p. 342: "The number of migrants that reached Philistia in the twelfth century cannot be established, yet something can be said about the scale of migration (Chapter 8). According to calculations of the inhabited area, the population of Philistia after the arrival of the migrants numbered about twenty five thousand in the twelfth century (reaching a peak of thirty thousand in the eleventh century). The continuation of local Canaanite material culture and toponyms indicates that a good part of the population was local. The number of migrants amounted, at most, to half of the population, and perhaps much less. Even the migrant population probably accumulated over at least two generations, the minimum estimated time for the continuous process of migration." ^ Philippe Bohstrom, 'Archaeologists find first-ever Philistine cemetery in Israel,' Haaretz 10 July 2016. ^ a b Tenney, Merrill (2010), The Zondervan Encyclopedia of the Bible, 4, Zondervan, ISBN 9780310876991, Little is known of the Philistine language or script. There is never any indication in the Bible of a language problem between the Israelites and Philistines. The Philistines must have adopted the local Semitic language soon after arriving in Canaan, or they might have already known a Semitic language before they came. Their names are usually Semitic (e.g., Ahimelek, Mitinti, Hanun, and the god Dagon). But two Philistine names may have come from the Asianic area: Achish has been compared with Anchises, and Goliath with Alyattes. A few Hebrew words may be Philistine loanwords. The word for helmet (koba H3916 or qoba H7746) is a foreign word often attributed to the Philistines. The term for "lords," already mentioned (seren), can possibly be connected with tyrannos ("tyrant"), a pre-Greek or Asianic word. Some have connected three seals discovered in the excavations at Ashdod with the Philistines. The signs resemble the Cypro-Minoan script. Three inscribed clay tablets from Deir Alla (SUCCOTH) also have been attributed to the Philistines. These signs resemble the Cypro-Mycenaean script. Both the seals and clay tablets are still imperfectly understood. ^ Peter Machinist (2013). "Biblical Traditions: The Philistines and Israelite History". In Eliezer D. Oren (ed.). The Sea Peoples and Their World: A Reassessment. University of Pennsylvania Press. pp. 53–83. , p.64. ^ a b Rabin 1963, pp. 113–139. ^ T. P. Harrison, "Neo-Hittites in the land of 'Palistin'. Renewed investigations at Tell Ta‘yinat on the plain of Antioch", Near Eastern Archaeology 72(4), 2009, 174–89, esp. 175. ^ Mark Weeden, "After the Hittites: The Kingdoms of Karkamish and Palistin in Northern Syria," Bulletin of the Institute of Classical Studies 56(2), 2015, 1–20, esp. 19. ^ Emanuel, Jeffrey P. "King Taita and His Palistin: Philstine State or Neo-Hittite Kingdom?" Antiguo Oriente 13 (2015), 11–40 (link). Bonfante, G. (1946). "Who were the Philistines?". American Journal of Archaeology. 50: 251–262. Dothan, Trude Krakauer (1982). The Philistines and Their Material Culture. New Haven, Connecticut: Yale University Press. ISBN 0-300-02258-1. Dothan, Trude Krakauer; Dothan, Moshe (1992). People of the Sea: The Search for the Philistines. New York: Macmillan Publishing Company. ISBN 0-02-532261-3. Dothan, Trude Krakauer; Gitin, Seymour; Mazar, Amihai; Stern, Ephraim (1998). Mediterranean Peoples in Transition: Thirteenth to Early Tenth Centuries BC. Jerusalem, Israel: Israel Exploration Society. ISBN 965-221-036-6. Ehrlich, Carl S. (1996). The Philistines in Transition: A History from ca. 1000-730 BC. Leiden, The Netherlands: E. J. Brill. ISBN 90-04-10426-7. Fahlbusch, Erwin; Bromiley, Geoffrey William (2005). The Encyclopedia of Christianity, Volume 4: P-Sh. Grand Rapids, Michigan: Wm. B. Eerdmans Publishing. ISBN 0-8028-2416-1. Fantalkin, Alexander; Yasur-Landau, Assaf (2008). Bene Israel: Studies in the Archaeology of Israel and the Levant During the Bronze and Iron Ages Offered in Honour of Israel Finkelstein. Leiden, The Netherlands: Brill. ISBN 90-04-15282-2. Finkelstein, Israel (December 2002). "The Philistines in the Bible: A Late-Monarchic Perspective". Journal for the Study of the Old Testament. 27 (2): 131–167. doi:10.1177/030908920202700201. Grabbe, Lester L. (2008). Israel in Transition: From Late Bronze II to Iron IIa (c. 1250–850 B.C.E.). Volume I. The Archaeology. New York and London: T & T Clark International. ISBN 0-567-02726-0. Herzog, Chaim; Gichon, Mordechai (2006). Battles of the Bible. Barnsley, South Yorkshire: Greenhill Books. ISBN 1-85367-681-0. Jastrow, Marcus (2005) . A Dictionary of the Targumim, the Talmud Babli and Yerushalmi, and the Midrashic Literature. Peabody, Massachusetts: Hendrickson Publishers. ISBN 1-56563-860-3. Jones, A. (1972). "The Philistines and the Hearth: Their Journey to the Levant". Journal of Near Eastern Studies. 31 (4): 343–350. doi:10.1086/372205. Killebrew, Ann E. (2005). Biblical Peoples and Ethnicity: An Archaeological Study of Egyptians, Canaanites, Philistines, and Early Israel, 1300-1100 B.C.E. Atlanta, Georgia: Society of Biblical Literature. ISBN 1-58983-097-0. Levy, Thomas E. (1998). The Archaeology of Society in the Holy Land. New York, New York: Continuum International Publishing Group. ISBN 0-8264-6996-5. Maeir, A. M. (2005). "Philister-Keramik". In Frantz-Szabo, Gabriella; Hellwag, Ursula (eds.). Reallexikon der Assyriologie und Vorderasiatischen Archäologie, Band 14. Berlin, Germany: Walter de Gruyter. pp. 528–536. Mendenhall, George E. (1973). The Tenth Generation: The Origins of the Biblical Tradition. Baltimore, Maryland: The Johns Hopkins University Press. ISBN 0-8018-1267-4. Meyers, Eric M. (1997). The Oxford Encyclopedia of Archaeology in the Near East: Volume 4. Oxford, United Kingdom: Oxford University Press. ISBN 0-19-506512-3. Oren, Eliezer D. (2000). The Sea Peoples and Their World: A Reassessment (University Museum Monograph 108). Philadelphia, Pennsylvania: The University Museum, University of Pennsylvania. ISBN 0-924171-80-4. Rabin, Chaim (1963). "Hittite Words in Hebrew". Orientalia. 32: 113–139. Redford, Donald Bruce (1992). Egypt, Canaan, and Israel in Ancient Times. Princeton, New Jersey: Princeton University Press. ISBN 0-691-03606-3. Ussishkin, David (2008). "The Date of the Philistine Settlement in the Coastal Plain: The View from Megiddo and Latish". In Grabbe, Lester L. (ed.). Israel in Transition: From late Bronze II to Iron IIa (c.1250-850 B.C.E.). Volume I. The Archaeology. New York: T & T Clark International. pp. 203–216. ISBN 9780567027269. Vandersleyen, Claude (2003). "Keftiu: A Cautionary Note". Oxford Journal of Archaeology. 22 (2): 209–212. doi:10.1111/1468-0092.t01-1-00005. "Philistines" . Catholic Encyclopedia. 1913. "Philistines" . Encyclopædia Britannica (11th ed.). 1911.